Do you use edibles in your front porch containers? This year I tried a combination of edible flower and vegetable I really like: Swiss Chard and Violas. Violas are dainty little flowers but are surprisingly capable of standing up to New England summers. I planted Johnny-Jump-Up Viola seedlings into containers in mid May and they are still flowering. 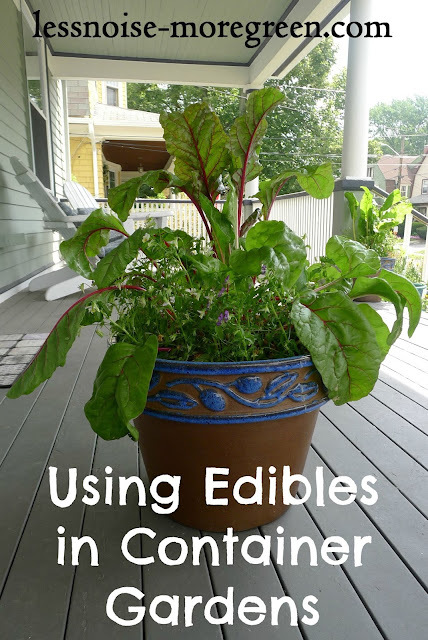 For height in the containers I planted Bright Lights Swiss Chard seeds and now that the plants have achieved maturity, I have the look I wanted: a tall colorful stemmed foliage plant surrounded by a myriad of small flowers. The uninformed would not know this is an edible arrangement, but I can snip leaves and pick flowers for salads all summer long. I think theses containers look right at home on my front porch. wonderful use of our containers with the bonus of eating the offerings!! Yes and they have held up really nicely and this summer has been a hot one. Cultivates dependably add character to any house. Obviously, it additionally meets its own particular usefulness. Whether you need your greenery enclosure to be principally existent as adornments or so as to have your own particular crisp supply of natural products, vegetables of new blooms, it can simply fill its need when made with consideration. In the event that you need to get more out of your patio nursery, then you can attempt palatable scenes.